The Danforth East Arts Fair Is This Weekend! We LOVE Autumn - when it's breezy enough to wear our favourite cardigans while feeling the sun kissing our faces - and we can stroll through parks filled with tents of local exhibitors showcasing their talents and wares. Especially this weekend where, on the west side, the Queen West Art Crawl takes centre stage in Trinity Bellwoods Park, and on the east side there's the fabulous Danforth Arts Fair located in East Lynn Park on The Danforth. The sixth annual Danforth East Arts Fair is a free event which showcases the talents of a diverse range of local artisans in a gorgeous natural setting. The event runs from 10am-5pm Saturday and Sunday, rain or shine! Snacks prepared by local restaurants and charities are available for sale in the park to satiate your hunger. Have kids? 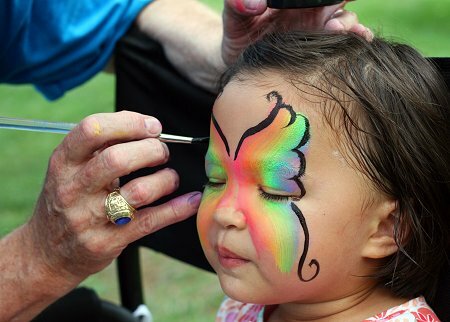 There are children’s activities, arts and crafts including face painting and artist-led workshops. Plus there's live acoustic music throughout the day! If you're not already a resident of The Danforth neighbourhood, but you're considering this location for its great value, awesome location on the Bloor subway line, and its reputable schools, this event is worth checking out so you can see how dynamic and family-friendly this brilliant location is. As realtors who love this neighbourhood for value and lifestyle, the Danforth East Arts Fair exemplifies the magic of this neighbourhood. Here's more information on The Danforth East Arts Fair! Not familiar with The Danforth? Here's our Danforth Neighbourhood Page including recent real estate sales, city census information and blog posts highlighting this awesome location. Like what you've read? Along with our forte selling unique urban spaces and other Toronto real estate, our FREE monthly newsletter explores housing, culture and design in Toronto. Consider signing up in the box below! It’s Time For The Queen West Art Crawl! Hello Annex And Seaton Village!